Codefight CMS - A light weight Codeigniter php framework cms. Codefight CMS is based on CodeIgniter Framework - Open source PHP web application framework, which is very easy to learn. 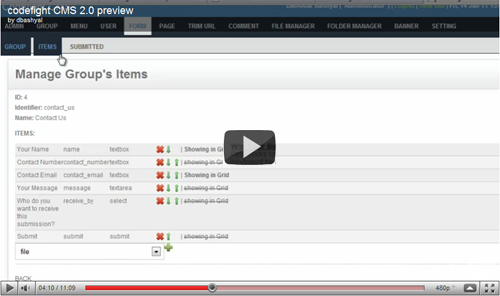 The latest version will have a multiple website manager. The new version is almost ready and is in staging for testing purpose before its official release. If you would like to get informed about the latest releases and news please do subscribe to our feed. Since Codefight CMS is available for use free of charge, I would appreciate and welcome any feedback, contributions to the code and help translating language files into your language. This is now available on Github. You can use this PHP CMS in any way you want: You can modify it as you like and use commercially for free. I hope one day it will be one of the top Codeigniter CMS and best Open Source CMS. 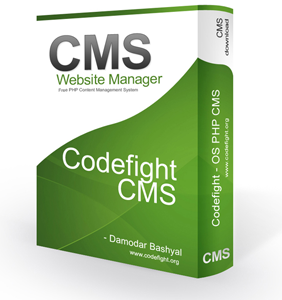 Codefight CMS 2.0, a multiple website management software, based on codeigniter 2.0 php framework.